Thinking about getting an extension for your home? Perhaps you want somewhere to work or even to just relax. Conservatories have become a great way to add more space to your home and add value to your property. Perhaps you want to use it for a garden room, add an extra room to your house, or want a completely new modern look for your property? 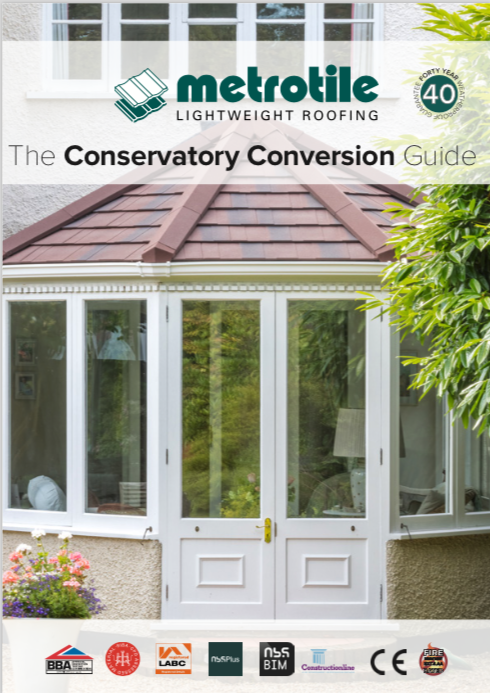 There are lots of things to consider when planning your dream conservatory, so we’ve put together this useful guide to make sure you have all the information you need to choose the roof that’s right for your project. In the traditional sense, conservatories began as a place to grow plants in more controlled conditions. In modern times, the purpose has changed to instead becoming a living space away from the rest of the home. The legal definitionof a conservatory is a building with at least 50% side walls and 75% roof area with translucent glass or polycarbonate glazing. There are many different types of conservatories. Orangeries are different, originating from the 17th-19thCentury as a place to grow citrus plants. The major modern differences are that Orangeries are instead seen as more of a luxury space, being larger and containing more brickwork, in contrast to the smaller and more simple design of conservatories. Choosing the right material for your conservatory can vastly change the temperature, the light and the maintenance of your project. Therefore, it is essential to carefully consider the options in the early stages. Using materials like glass can often provide a vast open feel to your space, but ultimately might feel like a greenhouse in the summer months due to the trapping of heat in the property. Alternately, this can also be a problem in the winter months as it can let in the cold air into the rest of your home, which is not energy efficient. Brick allows your extension to seamlessly blend in with the aesthetic of your property. It is possible to fit insulation in the brickwork to retain heat during winter, maintaining the temperature of the space. Glass roofing has traditionally been the most popular solution. With a transparent roof, your conservatory will receive natural light from the sun, which means artificial light won’t be as necessary in the summer months. This also creates a sense of space, making the room feel bigger than it is. Glass can be less susceptible to general damage, such as scratching, than UVPC alternatives. The disadvantages to certain types of glass are that it can generally be warmer in summer months due to the heat penetrating the roof during the day. Cleaning will also be more frequent with a glass roof as debris will inevitably gather on the roof, not only obscuring the light, but can be unpleasant to look at. Even double-glazed glass options do not hold in the heat as well as solid tiled roofing solutions so high heating bills could also be classed as a disadvantage over a solid tiled alternative. This roofing type is also extremely popular due to the fact they tend to be a cheaper alternative to glass or solid tiled roofs. UPVC is incredibly lightweight therefore easy to install and due to the low cost of materials repairs can be made easily and cost effectively. The downsides to using uPVC roofs are that they can be prone to damage due to the materials used and also tend to cause excessive heat during the summer months because of the amount of sunlight they let in. They also don’t retain the heat within the space as well as other roofing options, so they tend to lead to cold conservatories during the winter months. Tiled roofs take the best aspects from the previous materials, allowing you to enjoy your conservatory whatever time of year. Additionally, you can have more privacy and adding your own lighting to your space, which isn’t a characteristic associated with glass roofs. They can reduce glare, energy costs and insulate the space from noise. There are more options for customization with tiled roofs, coming in a range of colours and designs, with even tinted glass as a possible feature. Tiled roofs can be installed with minimal disruption to your property, meaning it won’t be a nuisance during this period. What types of roof tiles are can be installed? 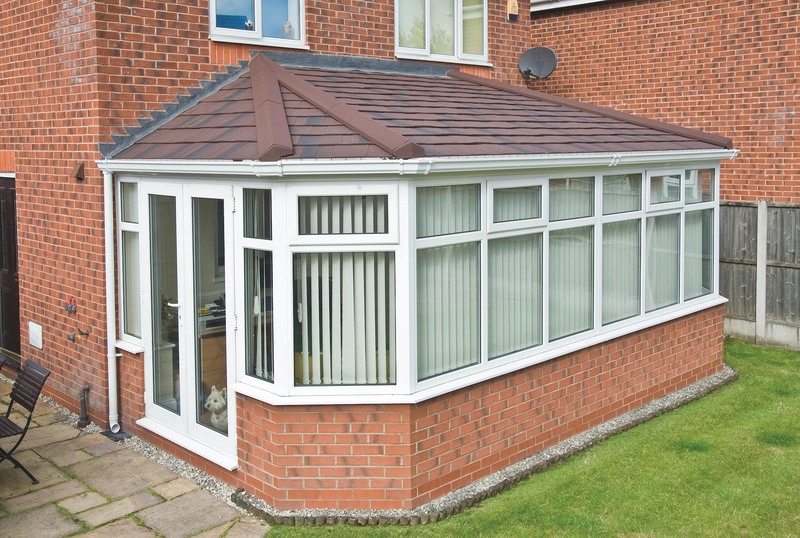 If you have chosen to proceed with tiled roofs, it’s time to consider which type of tiles will work best for your conservatory. Traditionally, the four most popular types of tiles are slate, clay, concrete and steel. As a more traditional option, slate is made from natural stone and have a lifespan of up to 100 years. As an eco-friendly product, they can be recycled at the end of their use. Slate is resistant to water and isn’t affected by seasonal changes. Slate can be expensive in comparison to other methods, costing as much as £150 per square metre. Unlike newer materials, slate can be harder to install, taking longer and potentially causing disruption to your lifestyle. For an attractive, eco-friendly and natural material, clay comes in a range of colours and finishes. It is resistant to fire and water. It is a popular and recognisable look which can enhance the look of your conservatory. Clay can require more maintenance than steel roofing tiles due as they can crack in more extreme weather conditions. They can be more expensive than other options, and you will need to find a similar coloured tile if they do break. For a modern finish, concrete is a durable type of tile which can last up to 50 years. They are fire resistant in emergencies and can be very tough against adverse weather conditions. Whilst they are eco-friendly, they are not biodegradable. Concrete is a heavy material, and which means they need a strong structure to support them. Concrete is also susceptible to absorbing moisture causing mould and mildew to grow. Lightweight steel roofing tiles have become popular in recent years, due to its easy maintenance and capability to withstand severe weather conditions. Like concrete they are extremely durable, lasting up to a guaranteed 40 years if installed correctly. As a modern solution, steel tiles come in a variety of colours, allowing you to choose the design of your new conservatory to suit its current aesthetic, or to create an entirely new one. Low pitch or flat roof? Choosing the style which works for you is imperative when creating your dream conservatory look. The two most common are low pitch and flat roofs. Normal roof structures have become rarer in recent years, and so low-pitched roofs are the perfect angular alternative. Providing excellent drainage, low-pitch roofs can be more durable as the tiles are constructed to last between 30-40 years making it a financially viable option. One of the only drawbacks to these roofs are that they require a longer installation due to the specifications. There are several things to consider when choosing a flat roof. They are quick to install and can be perfect if you wish to have a green roof for a more natural look, creating a space for plants to grow. Flat roofing can be economic and efficient, saving both money and time. However, flat roofs are not as durable as low-pitched roofs, as they have a more limited lifespan and are more easily damaged. They don’t provide as efficient drainage as the former and can potentially require frequent maintenance if not installed correctly. Conservatories can require regular maintenance for many reasons such as condensation, ventilation, heating, and leaking. Here are several solutions to keep your conservatory in optimum condition. Due to the location of your conservatory, there is a chance that condensation can occur within your space. This can most likely happen during the winter months, due to the cooler temperatures outside working against the warmer conditions inside due to heating. The lack of ventilation can cause moisture to appear due to water droplets against your window. Opening your windows whilst turning on your heating allows optimum air circulation within your conservatory, which works towards reducing the water vapour. For optimum ventilation, keep your windows open by tilting them open at the top, or turn them inwards during the winter months. Another factor to consider is how you have furnished your space. Carefully think if certain blinds or curtains might be confining the moisture within the room. As previously discussed, materials such as glass and polycarbonate do not provide good insulation for your space, and therefore you might want to consider replacing the material, which will be more cost effective in the long term. Of course, if you don’t have the budget to replace the roof material of your conservatory there are cheaper methods of maintaining the same temperature. Try fixing a layer of polycarbonate under the glazing bars, creating an insulating air gap between the two materials to allow more a more air tight solution. Alternately, if you notice draughts from under the door or windows, fit filler strips to retain the heat. There are many problems that can occur with leaking, but perhaps leaking appears to be quite a common one for some. Roofs can be the weakest material of a conservatory and so water and adverse conditions can penetrate the tiles and leak into your space, potentially damaging your furnishings and interiors. If you notice that your roof is leaking, you first need to locate the point where the leak has started. If it is easy to find, it could be a problem with sealant and so will cause minor issues. If the leak isn’t as visible, you may potentially require professional help. By using a company like Metrotile, we provide an efficient and quick installation process. The installation is started by locking profile sheets together and nailed to the roof battens. Tiles are shaped, cut and formed to suit each individual roof design and easily accommodate features such as doors and windows for your new space. Here are 3 installation guides for Roman, Shingle and Bond & Slate, which show how to install your new conservatory roof. For a more visual guide, watch our installation guide featuring conservatory details and the five-way junction. Perhaps you feel now is the time to replace your conservatory roof. We’ve already spoken about the benefits of changing to a tiled roof, due to its quick installation with minimal disruption to your property. If you are experiencing frequent leaking or delamination, it might be time for a change. Removing the roof and replacing it with another material can be achieved by contacting a company like Metrotile. This process involves removing the roof to build more secure rafters for support. You can place lightweight tiles over the existing roof structure, so it will not change the look of the exterior, and not damage the supporting structure. In making the change, you can revitalise your conservatory back to its former glory, making it a safer and more cost effective in the process. If you are looking to replace your current conservatory roof, or perhaps install one to the end of your property, you will need to find out if you require planning permission. In the past, conservatories had to have a certain percentage of their roofing to be translucent to not qualify for planning permission, however due to changes in building regulation, means you might not need to provide it in the UK. It is possible to build a larger rear extension, (which can be up to 6m for attached and 8m for detached properties) but you must inform surrounding properties using the Neighbour Consultation Scheme. This scheme applies to single-storey rear extensions and involves notifying the local planning authority of your proposed project. They will then inform your neighbours, providing them the chance to raise any objections, giving them 21 days to raise concerns. If no complaints are received within the timeframe, then the project can ensue. The most important thing is to check the legal specification. Visit the Planning Portalwebsite to find out what you must comply with. To find out more about Lightweight roof tiles for your conservatory roof,get in touch with Metrotile by calling us on 01249 658 514 or you can fill in our contact form.